Our Berlin Gardens Poly Fan Back Gliding Settee is sure to provide hours of that uninterrupted relaxation you've been looking for! With a beautifully curved back and contoured seat, generous arm rests and an effortlessly smooth gliding mechanism, this settee will make the perfect oasis right in your backyard! Each settee will include two of our iconic Poly Fan Back Gliders and a convenient Settee Table to join them together. You will have the perfect place to rest those cold drinks, good reads and tasty treats to ensure you have everything you may need for a relaxing day! Our Berlin Gardens Poly Fan Back Gliding Settee is PERFECT for commercial use as well. With the convenience of having chair and table sets where your guests can relax and unwind, there's a reason why so many businesses choose to incorporate this piece into their outdoor spaces! Backed by a five year warranty when used in commercial applications, you can be confident knowing your invest in outdoor furniture will last many years! With an array of beautiful poly colors and optional Sunbrella seat cushions and throw pillows, it's easy to put together the perfect settee to compliment your unique outdoor space! Poly lumber is a traditional wood substitute made from recycled materials that will not chip, crack, rot, or develop mold. 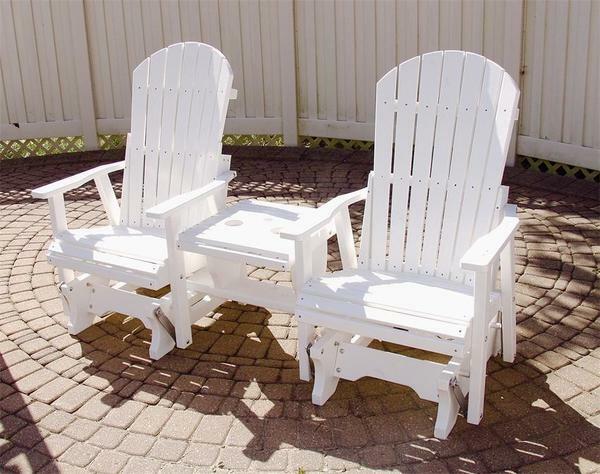 It is mildew resistant and termite resistant and requires no maintenance like painting, sanding or refinishing. Just clean your poly furniture with soap and water or a bleach and water solution to take care of heavier cleaning needs.